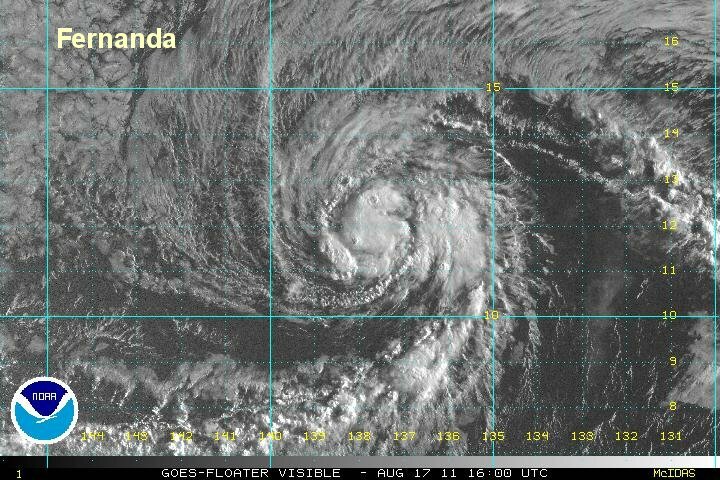 Fernanda is in the middle of the eastern Pacific far from land. A ball of convection surrounds the surface low with some rainbands away from the center. Fernanda is not a threat to land. As of 1 pm edt / 10 am pdt Greg was centered near 11.9 N / 137.9 W or about 2000 miles from the Big Island of Hawaii. Movement is west at about 9 mph. Top sustained winds are estimated at 45 (NHC 50 mph earlier advisory). Pressure 1001 mb. Forecasts take Fernanda west northwest over the next several days. It will slowly weaken over cooler water.